How do you delve behind school prospectuses? How do you choose the right school for your child? What factors other than academic rankings should you consider? 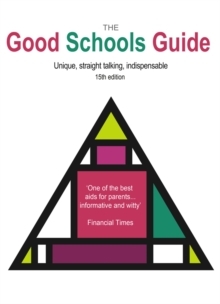 This well-established guide, now in its fifteenth edition - compiled by parents for parents and completely independent - combines facts and subjective interpretation to provide the ultimate guide for parents seeking the best school for their child. Spanning both the private and state sectors, "The Good Schools Guide" covers schools from age 5 to age 18. In addition to factual information such as contact details, entry requirements and fees, "The Guide" includes sections such as 'background and atmosphere' designed to enable parents to find the right match for their child. It also gives a refreshing analysis of each school's strengths and weaknesses.